Each time I walk into a spice shop, like Savory Spice Shop, I’m struck with the complex commingled aroma of the spices around me. Each seems to have a tale to tell of food created, meals enjoyed and places far away. 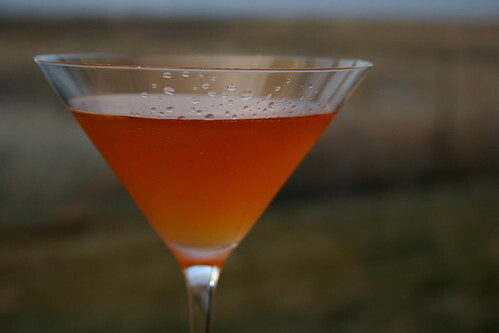 The Widow’s Kiss is the cocktail representation of that feeling. The combination of Benedictine and Chartreuse giving this drink an incredible depth and complexity and the calvados brightens everything up. This truly is like an old widow. She always has a smile on her face, but stop and chat with her for a while and you’ll hear tales of joy, tales of sadness and many more. Each of which will give you a new perspective on this bright cheery lady. Mixing up my first Widow’s Kiss I used the recipe from Vintage Spirits and Forgotten Cocktails that I mentioned earlier. I didn’t have any Yellow Chartreuse in my collection so I used my Green. My first note simply stated “this drink has stories to tell.” And so it does. Insane herbal complexity, hints of apple and a mellow sweetness. However, as the drink began to warm a bit, the herbal flavors came out stronger and stronger, eventually becoming more than I could handle. I ended up pouring out about half of this first attempt. A sad day indeed. Refusing to give up so easily I looked for other recipes only to find that almost every one of them was the same. The main point being that same recommendation of using Yellow Chartreuse instead of the Green. Being a slacker I still hadn’t picked up a bottle of Yellow so I tweaked the ratios and tried again. 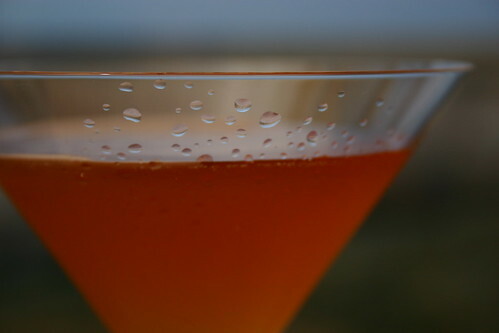 With 1/2 oz Green Chartreuse and 1/2 oz Benedictine, leaving the calvados alone, the drink is much more balanced. Additionally, the apple flavors came through much more prominently. Only problem was, despite the better balance, some of the herbal flavors were now too muted. I probably could have kept tweaking the levels until I was blue in the face, however, I decided to just pick up a bottle of Yellow instead. That was truly the “Aha” moment for the week. Yellow Chartreuse is 40% ABV unlike its punchy green bigger brother which weighs in at 55%. Back to the original proportions and I was a happy boy. This recipe has the complexity and the balance without the overwhelming herbal punch. The apple is present and the sweetness is still mellow and pleasing. This is definitely the recipe you want to use when you mix up this cocktail for yourself. I’m guessing there are more than a few hands raised out there after reading this recipe and the original. Let me just say this, yes, you should definitely shake this drink rather than stirring it. I realize this goes against the adage that all drinks with purely clear spirits should be stirred, but let me offer these reasons. One, this drink could use a bit of extra dilution from the ice flecks. It’s powerful and a bit of taming is a good thing. Two, you want this cold, very cold. You see, cold mutes flavors. So, as you take your first sip of this drink you’re not floored by the bold complexity. Instead it comes on slowly as the drink warms. So, the next time you sit down to contemplate the intricacies of life, mix up The Widow’s Kiss. I can’t promise that you’ll solve any problems, but I can promise that you’ll have a delightfully complex beverage to help smooth over the rough edges.